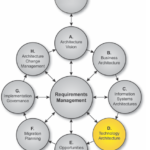 The Technology Layer of the Essential Meta Model is concerned with the Technology that provides and supports the systems that are in use in the organization – both software and hardware technology. Conceptual – The conceptual area is where we define the ‘what’. In technology terms, this means ‘what’ technology capabilities are required to provide the appropriate technology infrastructure for the enterprise. For example, Data Integration Services is a technology capability that describes ‘what’ is needed – but does not stipulate how – this capability is to be realized. Logical – The logical area is where we define the ‘how’. In technology terms this is the next level of abstraction of ‘how’ the ‘what’ will be achieved. These deals in terms of the classes of technology and the technology products that are available to realise the Technology Capabilities. Physical – The physical captures the implementation and deployments of technology in the enterprise. In the technology layer this means the lowest level of abstraction and captures the instances of the technology products and where they are physically deployed. 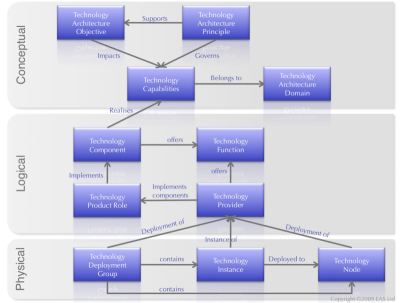 The Technology Architecture according to TOGAF follows B-DAT sequence. The Technology architecture is right at the lowest level of architecture because it is the layer that realizes architecture. The level of detail addressed in Phase D will depend on the scope and goals of the overall architecture effort. New technology building blocks being introduced as part of this effort will need to be defined in detail during Phase D. Existing technology building blocks to be supported in the target environment may need to be redefined in Phase D to ensure interoperability and fit-for-purpose within this specific Technology Architecture. The order of the steps in Phase D, as well as the time at which they are formally started and completed should be adapted to the situation at hand in accordance with the established architecture governance. In particular, determine whether in this situation it is appropriate to conduct Baseline Description or Target Architecture development first. This is particularly common in enterprises in which businesspeople have little or no engagement with architecture. As a result, architecture focuses on technology: a domain with which architects are likely to be familiar and over which they think they have control. This entry was posted in Technology and tagged Physical. Bookmark the permalink. ← Make up your mind, is it Information or Data?